On September 13, 2015, the Palestinians began a wave of popular terrorism (called a "popular awakening" by the Palestinian Authority). It began with riots on the Temple Mount and in Jerusalem during the Jewish High Holidays (second half of September 2015). It continued with a campaign of terrorist attacks which peaked in October 2015 (with 59 attacks). Since October the wave of terrorism has gradually waned. True science requires that data, observations and other evidence support a hypothesis – and that it can withstand withering analysis and criticism – or the hypothesis is wrong. Our theory explains everything that’s happening. Hotter or colder temperatures, wetter or drier weather, less ice in the Arctic, more ice in Antarctica – it’s all due to fossil fuel use. Climate scientism aggressively misrepresents facts, refuses to discuss energy and climate issues with anyone who points out massive flaws in the manmade climate chaos hypothesis, bullies anyone who won’t condemn carbon dioxide, and brands them as equivalent to Holocaust Deniers. Perhaps it’s not so settled. When the Australian government recently shifted funds from studying climate change to addressing threats that might result, 275 research jobs were imperiled. The very scientists who’d been saying there was a 97% consensus howled that there really wasn’t one. Climate change is very complex, they cried (which is true), and much more work must be done if we are to provide more accurate temperature predictions, instead of wild forecasts based on CO2 emissions (also true). Perhaps Mr. Nye and these Australian researchers should discuss what factors other than carbon dioxide actually cause climate and weather fluctuations. They may also encounter other revelations: that climate science is still young and anything but settled; that we have little understanding of what caused major ice ages, little ice ages, warm periods in between and numerous other events throughout the ages; that computer model predictions thus far have been little better than tarot card divinations. As for Nye’s assertions that “carbon dioxide has an enormous effect on planetary temperatures” and “climate change was discovered in recent times by comparing the Earth to the planet Venus” – those are truly bizarre, misleading, vacuous claims. The relatively rapid increase in atmospheric CO2 over the last 30 years has produced only 0.2°C (0.4°F) of global warming – compared to a 1°C (1.8°F) total temperature increase over the past 150 years. That means the planetary temperature increase has slowed down, as carbon dioxide levels rose. In fact, average temperatures have barely budged for nearly 19 years, an inconvenient reality that even the IPCC (Intergovernmental Panel on Climate Change) now recognizes. This is an “enormous effect”? By now, it is increasingly clear, the proper scientific conclusion is that the “greenhouse effect” of rising atmospheric carbon dioxide is very minor – as a recent article explains. Mr. Nye and his fans and fellow activists could learn a lot from it. Objective readers, and even Mr. Nye, would also profit from reading a rather devastating critique of one of The Scientism Guy’s “science-is-easy” demonstrations. It concludes that the greenhouse effect of CO2 molecules is of course real, but Mr. Nye’s clever experiment for Al Gore’s “Climate Reality Project” was the result of “video fakery” and “could never work” as advertised. When will Messrs. Nye and Gore stop peddling their Hollywood special effects? For that matter, when will they stop playing inter-planetary games? Mr. Nye and the popular media love to tell us that carbon dioxide from oil, gas and coal could soon turn Planet Earth into another Venus: over-heated, barren, rocky and lifeless. Princeton Institute of Advanced Study Professors Freeman Dyson and Will Happer show that this is utter nonsense. For one thing, Venus is far closer to the sun, so it is subjected to far more solar heat, gravitational pull and surface pressure than Earth is. “If we put a sunshade shielding Venus from sunlight,” Dr. Dyson notes, “it would only take 500 years for its surface to cool down and its atmosphere to condense into a carbon dioxide ocean.” It’s not the high temperature that makes Venus permanently unfriendly to life, he adds; it’s the lack of water. Second, the amounts of atmospheric carbon dioxide are grossly disproportionate. Earth has barely 0.04% carbon dioxide (by volume) in its atmosphere, whereas Venus has 97% and Mars has 95% CO2. Mars much greater distance from the sun also means it has an average surface temperature of -60°C (-80°F) –underscoring yet again how absurd it is to use planetary comparisons to stoke climate change fears. Third, Earth’s atmosphere used to contain far more carbon dioxide. “For most of the past 550 million years of the Phanerozoic, when multicellular life left a good fossil record, the earth’s CO2 levels were four times, even ten times, higher than now,” Dr. Happer points out. “Yet life flourished on land and in the oceans. Earth never came close to the conditions of Venus.” And it never will. Fourth, Venus’s much closer proximity to the sun means it receives about twice as much solar flux (radiant energy) as the Earth does: 2637 Watts per square meter versus 1367, Happer explains. The IPCC says doubling atmospheric CO2 concentrations would be equivalent to just 15 W/m2 of additional solar flux. That’s nearly 100 times less than what Venus gets from being closer to the Sun. Of course, none of these nerdy details about Earth-Venus differences really matter. We already know plant life on Planet Earth loved the higher CO2 levels that prevailed during the Carboniferous Age and other times when plants enjoyed extraordinary growth. However, even burning all the economically available fossil fuels would not likely even double current atmospheric CO2 levels – to just 0.08% carbon dioxide, compared to 21% oxygen, 78% nitrogen, 0.9% argon and 0.1% for all other gases except water vapor. And doubling CO2 would get us away from the near-famine levels for plants that have prevailed for the past tens of millions of years. Carbon dioxide is absolutely essential for plant growth – and for all life on Earth. Volumes of research clearly demonstrate that crop, garden, forest, grassland and ocean plants want more CO2, not less. The increased greening of our Earth over the past 30 years testifies to the desperate need of plants for this most fundamental fertilizer. The more CO2 they get, the better and faster they grow. More than 70% of the oxygen present in the atmosphere – and without which we could never live – originates from phytoplankton absorbing carbon dioxide and releasing oxygen. Keep this in mind when Bill Nye The Junk Science Guy tells you carbon dioxide is bad for our oceans and climate. Dr. Willie Soon is an independent scientist who has been studying the Sun and Earth’s climate for 26 years. Dr. István Markó is a professor of chemistry at the Université Catholique de Louvain in Belgium and director of the Organic and Medicinal Chemistry Laboratory. How do you distinguish a foreign policy "idealist" from a "realist," an optimist from a pessimist? Ask one question: Do you believe in the arrow of history? Or to put it another way, do you think history is cyclical or directional? Are we condemned to do the same damn thing over and over, generation after generation -- or is there hope for some enduring progress in the world order? For realists, generally conservative, history is an endless cycle of clashing power politics. The same patterns repeat. Only the names and places change. The best we can do in our own time is to defend ourselves, managing instability and avoiding catastrophe. But expect nothing permanent, no essential alteration in the course of human affairs. The idealists believe otherwise. They believe that the international system can eventually evolve out of its Hobbesian state of nature into something more humane and hopeful. What is usually overlooked is that this hopefulness for achieving a higher plane of global comity comes in two flavors -- one liberal, one conservative. Whether they call it global warming or climate change, activists on the left are acting as if the issue is just an excuse to extort money and expand the power of government. In Part I, I wrote about kleptocrats exploiting the issue to shake down western governments for enormous amounts of aid money. In Part III, I explained how the Kyoto Protocol encourages the destruction of jobs in western nations. Let’s now a fourth installment on how climate change is a racket. The Wall Street Journal reports on a legal scam concocted by left-wing activists to extort money from Exxon. A key meeting in the new push unfolded in January behind closed doors… The session brought together about a dozen people, including Kenny Bruno, a veteran of environmental campaigns, and Bill McKibben, founder of 350.org, two activists who helped lead the successful fight to block the Keystone XL pipeline. The new campaign’s goals include “to establish in public’s mind that Exxon is a corrupt institution that has pushed humanity (and all creation) toward climate chaos and grave harm,” according to an agenda of the meeting… This new legal strategy stems in part from environmentalists’ frustration at what they see as the inadequacy of recent climate deals. Their hope is to encourage state attorneys general and the U.S. Justice Department to launch investigations and lawsuits that ultimately will change Exxon’s behavior, force it to pay big damages. And the scam paid off, at least in the sense that a bunch of Democratic Attorneys General have launched a legal attack on the company. In an article for the Daily Signal, Hans von Spakovsky explores the implications. …we now have a new inquisition underway in America in the 21st century—something that would have seemed unimaginable not too long ago. Treating climate change as an absolute, unassailable fact, instead of what it is—an unproven, controversial scientific theory—a group of state attorneys general have announced that they will be targeting any companies that challenge the catastrophic climate change religion. …The inquisitors are threatening legal action and huge fines against anyone who declines to believe in an unproven scientific theory. Schneiderman and Kamala Harris, representing New York and California, respectively, have already launched investigations into ExxonMobil for allegedly funding research that questioned climate change. By the way, one amusing and ironic aspect of this attempted shakedown is that some of the left-wing activists are asserting that scientists for the energy companies are smarter than the ones mooching from the government. Writing for National Review, Rupert Darwall explains. Was ExxonMobil better at climate science than the Intergovernmental Panel on Climate Change (IPCC)? This is the bizarre position now being adopted by climate activists such as Harvard’s Naomi Oreskes and 350.org’s Bill McKibben. As early as 1977, Exxon researchers “knew that its main product would heat up the planet disastrously,” McKibben claimed in the New Yorker last month. …Had Exxon been up-front about the dangers of global warming, we might have started to decarbonize decades ago, Oreskes argues. Instead, Exxon had behaved like tobacco companies who had “long delayed” public understanding by suppressing the truth about the deadly nature of their products. But there’s one teensy-weensy problem with the tobacco company/oil company analogy. Scientists were able to prove the threat to health from smoking because there is a very strong statistical relationship between smoking and lung cancer. The strength of those initial findings was further validated by passing a tough predictive test. In 1953, Richard Doll, one of the first researchers to have found the link, predicted that in 1973 there would be 25,000 lung-cancer deaths in Britain. In fact, there were 26,000. By contrast, climate models have been systematically over-forecasting temperature rises this century, demonstrating that climate scientists know much less about the climate system than they would have us believe. Needless to say, if the models are wrong about the weather we’ve already had, why should we believe their future predictions? 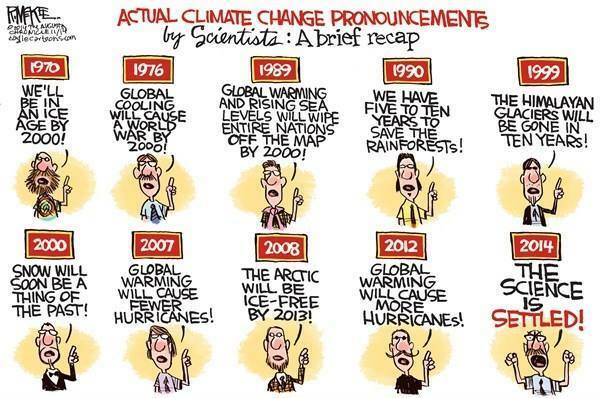 And the climate alarmists certainly have a long track record of flawed pronouncements. And suppression of inconvenient data. By the way, just in case these legal scams don’t work, some statists want to take the threats to the next level. In a modern-day version of the Church imprisoning Galileo, the self-styled Science Guy apparently doesn’t think much of open and honest inquiry. Here are some passages from a report in the Washington Times about Bill Nye refusing to reject jail time for skeptics. Local governments also are joining the campaign. Fox News reports that the City of Portland wants to censor dissenting views on global warming. Unsurprisingly, the Obama Administration is intrigued anti-science shakedown. Though at least there’s some resistance from Capitol Hill, as reported by the Washington Examiner. Attorney General Loretta Lynch must drop all efforts to prosecute climate change skeptics or risk engaging in “prosecutorial misconduct,” a group of Senate Judiciary Committee members warned. “As you well know, initiating criminal prosecution for a private entity’s opinions on climate change is a blatant violation of the First Amendment and an abuse of power that rises to the level of prosecutorial misconduct,” five lawmakers wrote to Lynch on Wednesday. …In March, Lynch told Sen. Sheldon Whitehouse, D-R.I., that the FBI was considering whether it was possible to prosecute companies or groups that promoted climate change skepticism. By the way, the fact that some leftists want to stifle dissent and redistribute money doesn’t mean global warming/climate change doesn’t exist. Heck the climate never stops changing. And it may now be changing in part because of human actions. That being said, I’m sure the right approach for dealing with climate change shouldn’t include central planning and other forms of statism. I have a hard time accepting the policy prescriptions of people who are nutjobs. In case you think I’m exaggerating, consider these examples. So it’s understandable why sensible people reject the agenda of radical environmentalists, even if there is some man-caused global warming. P.S. To close on an upbeat note, we have some decent environmentalist humor here, here, here, here, and here. P.P.S. On a more serious note, other governments also have moved to criminalize dissent. P.P.P.S. According to the political betting markets, the most likely V.P. candidate for Trump has a very shaky history on the topic of climate alarmism. First, the IRS Took $68K From Connecticut Bakers. Now, It's Investigating Them. 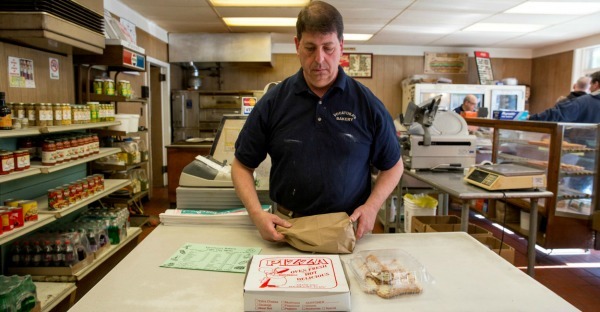 David Vocatura, who handles the bakery's finances, told The Daily Signal that in its near 100-year lifespan, Vocatura's Bakery has always been an honest business, paying its taxes, and obeying the law. 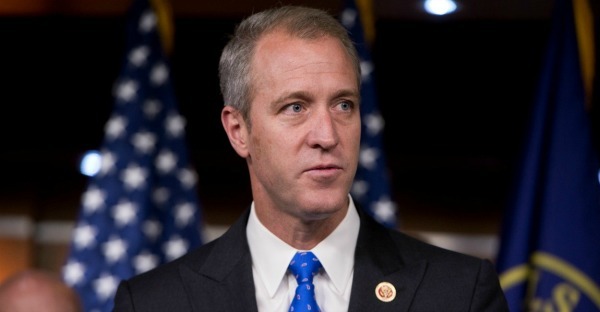 President Barack Obama's executive order and Democratic Rep. Sean Patrick Maloney's amendment treat conscientious judgments about behavior as if they were invidious acts of discrimination akin to racism or sexism. 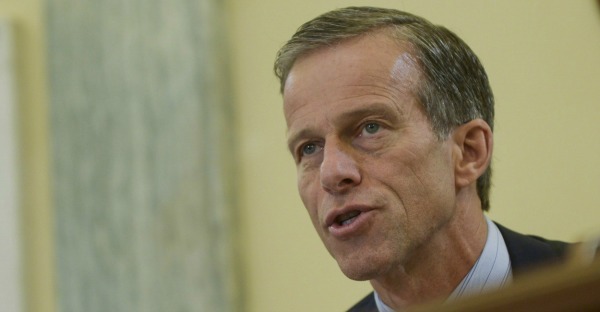 "The allegations that were made suggest that [Facebook] actually had curators who were suppressing conservative content and infusing liberal content," Sen. John Thune, R-S.D., said. "We're just trying to get to the bottom of it." 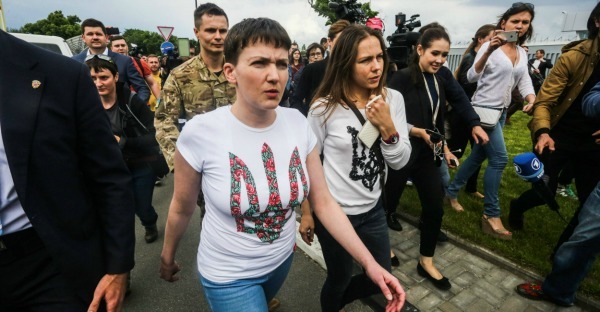 The sometimes-farcical nature of Ukrainian army helicopter pilot and Member of Parliament Nadia Savchenko's trial, and the flimsy, illogical evidence often presented against her drew comparisons among Ukrainians to Soviet-era show trials designed for propaganda value. Citing what he calls a "dangerous mismatch" between worldwide threats, and congressionally prescribed limits on spending to respond to them, Sen. John McCain, R-Ariz., has offered an amendment to the National Defense Authorization Act that would add $17 billion to the Pentagon budget. There wasn't a broad base of support for the energy and water spending bill among Republicans. For fiscal hawks, the topline spending levels made the bill unpopular. And for social conservatives, the LGBT amendment made the bill untenable. My Take - A number of years ago there was an interview with the Moonies by Mike Wallace 60 Minutes. They stated it was difficult to come to terms with the Moonies because they demanded the entire interview be broadcast - no editing. Initially I thought that was strange because interviews of this nature can take a lot of time - all of which couldn't possibly be shown on an hour long show. They finally agreed to the interview as long as they could film it also. That turned out to be enlightening. Mike Wallace - normally self assured and confident was clearly uncomfortable. Why? I know now the reason is they didn't dare present this interview in a way that would allowed the audience to draw incorrect conclusions from edited and slanted material. No matter what you may think of the Moonies - that doesn't justify fraudulent reporting....reporting the media has wallowed in for years. Dan Rather wasn't an anomaly - he was reality in the main stream media.....and they loved him for it. In years gone by 60 Minutes was reporting on some compound by Eli Lilly and stated Eli Lilly refused to be interviewed - giving Eli Lilly a patina of having something to hide. Funny thing there - I don't remember any of that report. Eli Lilly knew something we all had to learn - you can't trust the media. They aren't there to report the story - they're there to report "their" version of the story....and it's usually a leftist version. This pattern has played out forever....and we need to undrestand everything you see on the news and everything you read in the newspaper is a lie. Lies of commission for sure, but mostly lies of omission - deliberate ommissions to get people to draw inaccurate conclusions. Conslusions promoting some leftist vision or other. My Take - Woodrow Wilson was cut from the same cloth as Teddy Roosevelt and became known as America's first fascist president. But I consider Teddy Roosevelt the worst president of the20th century because he gave personality and impetus to the progressive movement in America, which was a sanitized version of European socialism, but with all of socialism's evil attributes. What's frightening is how Teddy is portrayed by the media, in books, and in history classes......he was not an American hero.....he was a traitor to his oath to support and uphold the Constitution which he - just as Wilson - believed was an impediment to human progress. We need to start paying attention to the real history of socialism in American and give far less credibility to the History Channel, which so often is so full of clabber it's enough to make knowledgeable people nauseous. The Buckeye Institute achieved another policy victory this week, as the Ohio House of Representatives passed a measure reforming civil asset forfeiture, a procedure under Ohio law that allows the government to take property from individuals who have not even been charged with a crime. On Wednesday, lawmakers approved House Bill 347, which eliminates civil asset forfeiture in most cases involving property worth less than $25,000, and strengthens what the government must prove for property to be forfeited. The Buckeye Institute provided policy guidance on this issue to legislative leadership, including the House Judiciary Committee Chairman. Buckeye's experts also testified about cases in which property was wrongly seized by the government costing innocent citizens thousands of dollars. "This policy is a significant step forward in protecting property rights, which at the same time preserves the ability of the government to seize property from those actually convicted of crimes," Daniel Dew, The Buckeye Institute's Criminal Justice Fellow, said. "Government exists to protect private property of the innocent, not to confiscate it," Robert Alt, president and CEO of The Buckeye Institute, said. "More can and should be done to protect the property rights of innocent Ohioans. Buckeye will continue to champion additional reforms to protect these rights." House Bill 347 will next go to the Senate, where it will likely be reviewed after the November election. Click here to read The Buckeye Institute's testimony on reforming civil asset forfeiture. Founded in 1989, The Buckeye Institute is an independent research and educational institution--a think tank--whose mission is to advance free-market public policy in the states. Clinton's dream of sending federal agents into American homes. A campaign ad that Hillary Clinton used against Barack Obama in 2008 featured images of sleeping children, with a voice asking who would answer the phone ringing in the White House at 3 a.m., “someone who already knows the world leaders . 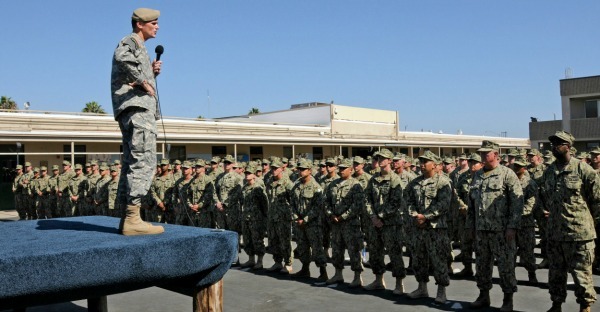 . . the military,” someone “tested and ready to lead”—or (by implication) a first-term U.S. Senator/community organizer? Hillary Clinton is running for president again, and of course is ignoring her failure as secretary of state to answer the late-night phone call coming from Benghazi on September 11, 2012. Instead, she is advertising how she wants to send federal emissaries into the homes of parents with newborn infants to teach them how to handle 3 a.m. feedings and baby talk. It’s an extension of her agenda as first lady in the Arkansas governor’s mansion and in the White House. Her political career, after graduating and having written a thesis on friend Saul Alinsky, was launched with the Children’s Defense Fund under the direction of Marian Wright Edelman, agitator for increased welfare “for the children,” including federally funded childcare workers. In that book Clinton wrote, “government is not something outside us—something irrelevant or even alien to us—but is us. To acknowledge this is to acknowledge that government has a responsibility not only to provide essential services but to bring individuals and communities together.” This is the backwards notion of the community organizer. She, however, ignores the studies, including one by the agency administering the program, that show that when Head Start does have a positive impact, it is slight and disappears by third grade. The Clinton Foundation, a purported charity (in reality a campaign slush fund with contributions helping friends’ business pursuits), is using the latest “gap” as the basis for the programs she hopes to enact as president. The campaign site explains: “This gap refers to the 30 million fewer words heard by lower-income children by the time they are 4 years old, which leads to disparities in language development and school readiness.” Low-income students already receive free breakfasts and lunches, even in the summer. Under the recently passed Every Student Succeeds Act they can look forward to attending “community schools,” where they will receive homework help, family dinners, and health and dental services. Initiatives, like the one to end the “word gap” may sound head-scratching-ly bizarre to people who have been around babies, and made idiots of themselves by cooing and lapsing into inane talk. But the studies that show that many low-income (i.e., single and government-dependent) parents do not speak to their young children are borne out by observation. But she stopped, explaining in an agonized voice that she couldn’t bear to watch how young mothers treated their children, with slaps and pulls, screaming abuses at them, at the train station. Of course, no one would dare reprimand such parents. So my friend retreated. Leftist parents retreat by sending their children to private schools, while arguing for more funding for public schools. The reaction is to retreat, to one’s car, and to vote for and advocate more government social programs so that “experts” can deal with such parents. Leftists refuse to acknowledge that government programs that incentivize family breakdown and interfere with natural communities are the problem. 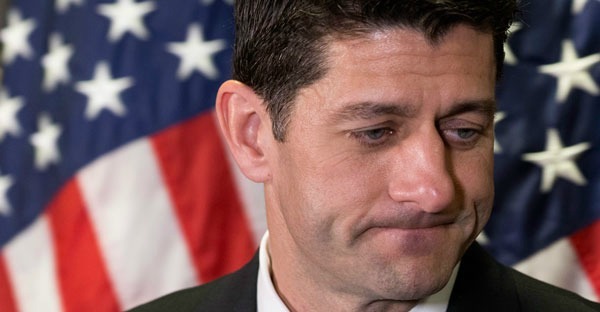 Conservatives, frustrated by the inability of political representatives to cut back on detrimental government programs and despairing at the takeover of education by radicals, retreat to far-flung suburbs, where they undertake the dual tasks of parenting and teaching. No one can or should blame them. In fact, they are to be commended. When I taught college I could count on homeschooled students to be better educated and more motivated than students from public schools. But with the retreat of such parents, public schools suffer. It’s a vicious cycle, but the progressive’s solution (or opportunity) is to use the deterioration as an entrée to more government meddling. 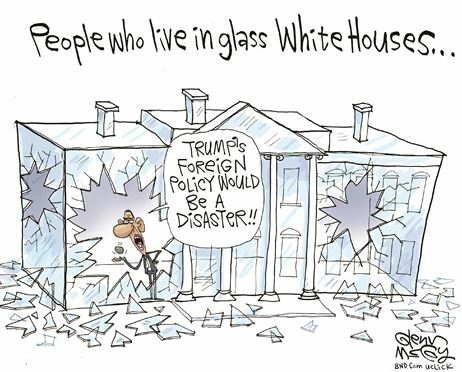 Now, especially in Obama’s final year, we are witnessing the Washington overlords hounding the middle-class citizens into their retreats. They are forcing “individuals and communities together” under Obama’s Affirmatively Furthering Fair Housing regulation of 2015. The suburbs are being forced to build housing for the poor, who will bring their dysfunction to everything from the playground to the shopping mall. As the feds impose their diktats on public spaces and private businesses, the homeschooling family will find fewer and fewer places where they are comfortable. Under Obama’s Department of Education, they have found themselves forced to adhere to crazy Common Core standards if they want to pass GED tests, college entrance exams, and AP exams. They find that many colleges now use Common Core test scores for placement in classes. This overreach inspired many conservatives into activism and made Common Core part of the presidential campaign. But as the presidential election approaches, many of the same conservatives are retreating--from the voting booth. Morally repulsed by the profligate past, rhetoric, and impure ideology of presumptive Republican nominee Donald Trump, they vow to back a third-party candidate, write in a name, or just stay home and pray. 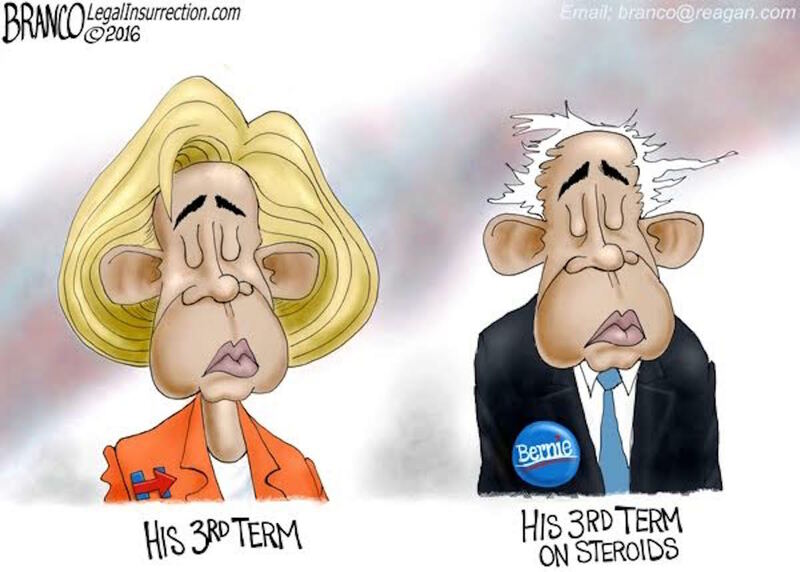 They are impervious to arguments that their retreat makes a Hillary Clinton (Obama.2) presidency likely. Trump expressed traditional sentiments and said he believed in supplying “funds,” but not changing diapers or pushing a stroller through Central Park. In contrast, I am reminded of one of many absurd helpful hints about fatherhood coming from the Obama administration. Early on, a Father’s Day campaign that encouraged fathers’ involvement showed a picture of a burly father with his young daughter. They were both painting their fingernails. Voters should be asking themselves if they want the Big-Nanny-in-Chief sending government agents into homes. Or do they want to become breadwinners again? One way to attack Western civilization is to change the learning environment from a quiet, contemplative one to a busy, communal one. Recently I was horrified to find the latest missive from the U.S. Department of Education in my email inbox. It was the Teachers Edition newsletter, which is usually full of teaching tips, like getting kids interested in “The Old Man and the Sea” by having them reenact a crucifixion during Holy Week. A linked Washington Post article described another classroom, where 28 fifth-graders “sit at specially outfitted kinesthetic desks” or stand at them swaying, or pedal bikes, or march on climbers, while teacher Stacey Shoecraft delivers instruction from a strider at the front of the room. Shoecraft was keynote speaker at the “Kidsfit’s National Charleston Training” and has written a book, “Teaching Through Movement,” on the cover of which a grinning boy jumps into the air and a smiling girl sits on an exercise ball—like one I used when doing physical therapy for my back. As if all this activity weren’t enough, an article headlined “Libraries Transforming from Quiet Places to Active Spaces” described the American Library Association’s new campaign to transform libraries from “quiet places of research” into “centers of community.” Instagram photos illustrated the concept with “collaborative work spaces, MakerSpaces, [and] bright displays.” The same day the Washington Post had set ten poems to animation in honor of National Poetry Month. So When Do We Read Books? As someone who found refuge in the quiet of the library and the order of the classroom as a child, I am disturbed by all this activity. As someone who taught college English for 20 years and saw students’ attention spans decline, I am saddened. My last year of teaching was in 2013, and by then only a couple students would raise their hands when I asked how many had had the experience of getting “lost in a book.” Only a couple had the patience to read carefully the assigned material by Frederick Douglass and Nathaniel Hawthorne. I’d been observing the transition in teaching styles away from what I knew in the 1960s, when we sat up straight with both feet planted on the floor at desks in rows. Increasingly, news reports show classrooms with kids sprawled on the carpet, reading or writing, or gathered around tables putting objects together, or gabbling like pip-squeak ambassadors about global politics. Such active learning has been popularized by teacher-celebrities, like Ron Clark, founder of the Ron Clark Academy in Atlanta. At their annual meeting in 2009, I saw social studies teachers applaud him as he jumped onto a chair to describe how his school encouraged “fun!” with a bungee jump and slides instead of staircases (which teachers also use). We were then treated to a demonstration of students’ understanding of civics—through the performance of a rap song about the election. At the community college where I was then teaching, the annual “faculty development” day featured a session where a popular biology professor rolled her shoulders and stepped side to side to demonstrate how she used dance moves to motivate students. I knew my efforts to adapt this method to discussions about poetic meter or punctuation would get nothing but laughter. It’s not what I signed up for when I earned my PhD and envisioned myself in the female version of the tweed jacket leading thoughtful discussions about John Donne. Behind all this emphasis on movement is the effort to close the racial achievement gap, one of the primary objectives of Common Core, evidenced through emphasis on “speaking and listening skills” and “visual literacy.” It’s also evidenced by the U.S. Department of Education’s promotion of educational video games. Such strategies presumably address different learning styles that are said to cause the gap. These educators asserted that black pupils “need more chances for expressive talking rather than writing” and “more freedom to move around the classroom without being rebuked for misbehavior. . . .” Back then the theory was controversial among educators. Today, the U.S. Department of Education promotes this kind of learning for all students. Thomas Sowell’s recounting of statistics about the superior performance of some black schools against similarly situated white schools during segregation refutes such ultimately racist ideas. He is ignored. That’s because the evidence Sowell presents undermines the stereotypes the Left uses to achieve its ultimate goal: tearing down or significantly altering Western civilization. One way to do that is to change the learning environment from a quiet, contemplative one to a busy, communal one. This assault on “Eurocentrism,” or Western modes of thinking, was deliberate in the 1960s. It is now in the classroom. Of course, those promoting the new kinesthetic teaching don’t say that. They talk about physical fitness (a problem, to be sure), “motivated” students, and superior test results. But I wonder: will such strategies backfire? Will making students perform “academic tasks” on treadmills compel them to hate both exercise and learning? I think it might. Such mechanistic exercises, along with Michelle Obama’s “Let’s Move” program, remind me of President Kennedy’s “Physical Fitness in Schools” program and having to run around the perimeter of a scruffy fenced-in yard at Carthage School Number 8 in Rochester, New York. I thought of this when I saw the picture of students on exercise machines. They reminded me of race horses being cooled down on mechanical walkers. “Academic tasks” sounds like dog training. The decade of the 1960s brought many upheavals: assassinations, demonstrations, riots. My first-grade class was dismissed early on the day of President Kennedy’s assassination. The riots in adjoining neighborhoods brought over vandalism and violence in ensuing years. Children still played in the streets, though. I would become the exception as I assumed the role of caretaker for my younger sisters. Yet I still had the classroom and library as places of refuge. We were not put on machines; the mandatory runs ended. I could also walk to the library with my cherished yellow library card. That quiet, mote-filled refuge, long disappeared in urban decay, held rows of books beckoning me to get lost in the wonderful stories. It’s sad that children today are deprived of such simple, quiet pleasures. Mary Grabar earned her PhD from the University of Georgia and taught college English for 20 years. She is now a resident fellow at the Alexander Hamilton Institute for the Study of Western Civilization in Clinton, New York. Her writing can be found at DissidentProf.com and at marygrabar.com. Venezuela is falling apart. Decades of bad policy have produced economic stagnation and misery. On the other side of South America, Chile has enjoyed comparatively strong growth since reforms began in the 1980s. Can we learn lessons by comparing these two nations? Yes. More than five years ago, I compared three decades of data to show that pro-market Chile grew somewhat faster than mixed-economy Argentina and much faster than statist Venezuela. Now we have some new data. My colleague at the Cato Institute, Marian Tupy, has an article in Reason that compares Chile and Venezuela. He starts by noting that the two nations have moved in dramatically different directions when measuring economic freedom. Chile’s success starts in the mid-1970s, when Chile’s military government abandoned socialism and started to implement economic reforms. In 2013, Chile was the world’s 10th freest economy. Venezuela, in the meantime, declined from being the world’s 10th freest economy in 1975 to being the world’s least free economy in 2013. Here’s a sobering chart on the changes. Some may believe that economic freedom as merely an abstraction. What’s more important, they argue, is results. Is a nation enjoying good economic performance, or is it stagnating? Well, it turns out that the abstraction of economic freedom is very important if you want good performance. Here’s another chart from Marian’s article. You can see that Venezuela has stagnated while Chile has boomed. Chile is not a perfect role model, to be sure, because of an unsavory period of military rule. But the good news, Marian points out, is that economic liberty has led to political liberty. Whereas the opposite has happened in Venezuela. …as the people of Chile grew richer, they started demanding more say in the running of their country. Starting in the late 1980s, the military gradually and peacefully handed power over to democratically-elected representatives. In Venezuela, the opposite has happened. As failure of socialism became more apparent, the government had to resort to ever more repressive measures in order to keep itself in power. Here’s a chart showing the remarkable progress in Chile..as well as the deterioration of rights in Venezuela (please note that “1” means strong political rights and “7” means low or nonexistent political rights). All this data seemingly is slam-dunk evidence for the Chilean model over the Venezuelan model. Yet there have been a number of leftists who actually praised the statist policies of Venezuela’s authoritarian rulers. Here are some excerpts from an exposê in the Daily Caller. Socialist Venezuelan dictator Hugo Chavez was praised throughout his life by many figures in academia, journalism and Hollywood despite his brutal regime. This praise included Salon writer David Sirota’s piece after the leader’s death, titled “Hugo Chavez’s economic miracle.” In British publication The New Statesman, a headline as Chavez was nearing death in January 2013 was “Hugo Chavez: Man against the world,” and its sub-headline read “As illness ends Hugo Chavez’s rule in Venezuela, what will his legacy be? Richard Gott argues he brought hope to a continent.” This praise of Chavez by so many who enjoyed the benefits of living in a capitalist society while looking at the economic record of the late leader, as well as what his successor President Nicolas Maduro, has come undone. And Joe Stiglitz gushed about Venezuela’s economic performance back in 2007. Wow, this is a remarkable case of ideological blindness. Stiglitz presumably allowed his statist views to drive his analysis. But let’s focus on one part of that excerpt. Yes, it’s very desirable for all citizens to benefit from economic growth. But if you look at the chart from Marian’s article comparing GDP per capita in Chile and Venezuela, it’s abundantly clear which nation is producing better outcomes from average citizens. This is a fundamental flaw of statists. By fixating on redistribution and equality, this leads them to policies that re-slice a shrinking economic pie. The evidence from all over the world is that this is not a recipe for convergence with rich nations. Why does the DNC Hate Israel? A 44 Percent Bee Decline?